Joe Atkinson has started both of Wasps' opening games this season. Wasps’ Joe Atkinson spoke to TRU about the importance of his time at Loughborough University and the positive beginning to his Premiership career. Wasps forward Joe Atkinson is certainly enjoying his maiden season in the Gallagher Premiership. The 26-year-old has started both of Wasps’ opening two fixtures this term against Worcester Warriors and Exeter Chiefs after joining from London Scottish in the summer. Atkinson has hit the ground running at the Ricoh, but his journey to the Premiership began at Loughborough University after suffering a setback early in his career. Speaking to TRU, the back-rower said: “I went to university. I didn’t get my academy contract when I was at London Irish which was tough, so I went down the university route with Loughborough. As a Loughborough player, Atkinson played BUCS rugby, represented England Students and also achieved promotion with their National League side before grabbing the attention of Championship outfit Cornish Pirates. Atkinson is just one of many current Gallagher Premiership players who have taken the university route to progress their career and with a number of younger athletes flourishing in the spotlight of BUCS Super Rugby, he believes studying and playing a high level of rugby is a perfect combination. Atkinson is now hoping his own rugby journey can continue on an upward trajectory. He was one of a handful of signings from the Championship in the off-season to move to the Ricoh and having being thrown straight into the starting XV, the flanker is excited for his future at Wasps. “It’s been a massive step up, but I’m enjoying it”, he said. “There is a lot of talent in the Championship so it is just good to see the Premiership clubs look to the Champ to help the progression of a few of the lads. “In the back row, I have got the likes of Nathan Hughes, Nizaam Carr and Ashley Johnson to look at as well as Thomas Young. They are all top players so I’ve got so much talent around me to learn from.
? 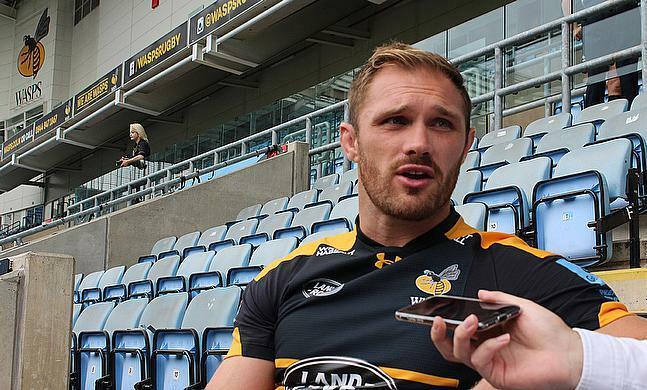 ?WATCH New signings @atko7 and @Searly10 look ahead to the @gallagheruk_ @premrugby Rugby game at the @RicohArena against Leicester Tigers. Wasps have begun the season with a narrow win over Worcester, but suffered a defeat in their first home game of the campaign against Exeter last Saturday. Dai Young’s side host Leicester Tigers this weekend and Atkinson admitted Wasps are aiming for honours this term.